After being hyped to high Heaven for last year’s SAGE only for the Sonic Nexus team to miss a planned demo release, the cycle comes full circle again, as another round of revisions and another round of marquee caliber hype have again yielded no public results in time for this year. 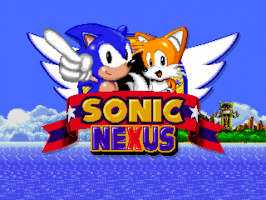 This go-around, either, the Sonic Nexus team made the clear call a week before the expo. With the show one week away and only one new zone out of the two planned for the next released completed, we are making an announcement that we will not be releasing anything playable during SAGE 2009. Brad has been saying for the past few months that the SAGE demo was no guarantee. With the bulk of the work only done during the past two months, busy personal lives throughout 2009, and SAGE starting a month earlier, Hunter, Brad and Christian will not be able to produce by next week. Even with new content available, we will not release anything less than what we want to. We were making concessions left and right over the past two months for a possible SAGE demo, such as cutting the music options, Tails, Knuckles, and the second boss in each zone. Once we were cutting too much, Brad made the decision to pass on the show and focus on the original 3-zone demo plan with all the features. Its release date will not be established nor estimated. However, its content shall remain what it has been for the past few months. The 2009 demo will include all three characters, three zones, six bosses, and the three soundtracks. All of the pomp of the final product, but three zones and without special stages. We hope that you continue to check back here for updates during the show for more information about our 2009 release. As noted above, there is now no timetable for the next release of Nexus. As this year’s SAGE requires the existence of a demo, it now appears there will be no presence of the game at all, unless an old copy is given to the masses to digest. TSSZ News will continue to bring you developments on the progress of Sonic Nexus.